Saving for retirement is one thing but withdrawing those funds each month after you’ve retired is another monster entirely. You want to make sure you have plenty of money to live a comfortable life after you retire but how do you come up with the right withdrawal strategy so you don’t go through all that money too quickly? 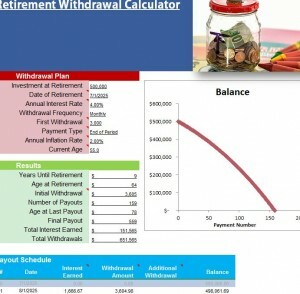 The Retirement Withdrawal Calculator is a smart tool to help you plan your future. 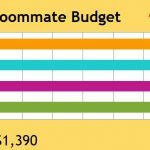 This template will calculate the amount you should take out each month in order to have a steady flow of money for your relaxing new retiree lifestyle. 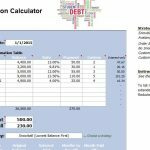 The calculator template was designed to be as simple and straightforward as possible. In each table there is a list of items. You will simply enter the required amount for each item in the cell to the right of that item. Start in the “Withdrawal Plan” table. Here, you will begin to craft your withdrawal plan. The table has you enter information that will help you organize your retirement dates and expectations. You can list the date, age, and amount you want to retire with as well as interest rates and your planned inflation rates. The next table, “Result”, will take the data you entered in the table above and give you calculated results that illustrate the amount you should withdraw each month to maintain a stable balance in your accounts. The Retirement Withdrawal Calculator will also list out all your payments one by one in the large table below. You can see how each monthly payment takes from your retirement balance and adjust your plans accordingly. You can even edit additional withdrawals for a month if the need arises. The graph at the top of the screen shows you the number of payments vs your starting retirement balance and how that will sustain over time. Save yourself a lot of hassle and headache by planning your retirement ahead of time. 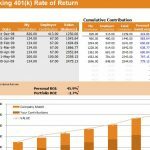 Download the free Withdrawal Calculator.